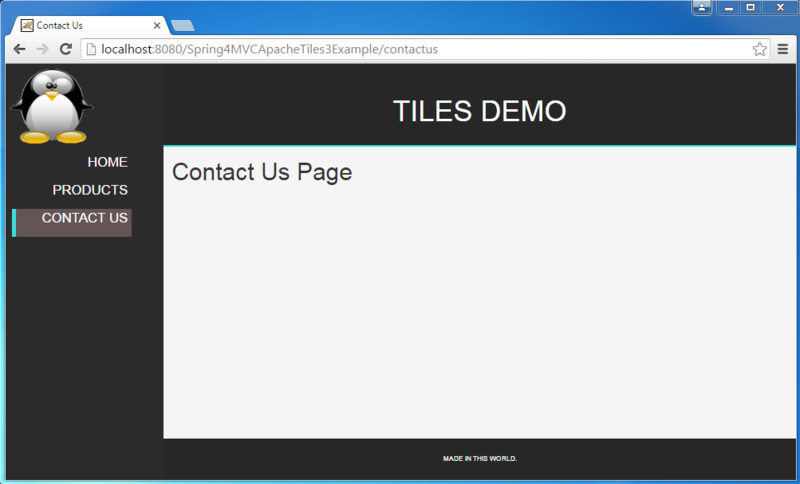 In this post we will integrate Apache Tiles 3 with Spring MVC 4, using annotation-based configuration. Apache Tiles is a template based, composite view framework: it allows to reuse page pieces across the application, keeping consistent look and feel. Page layouts in general contains several page-fragments like header,footer, menu & content. In a consistent layout, only content changes between page navigation while other page fragments like header,footer & menu remains fixed most of the time. 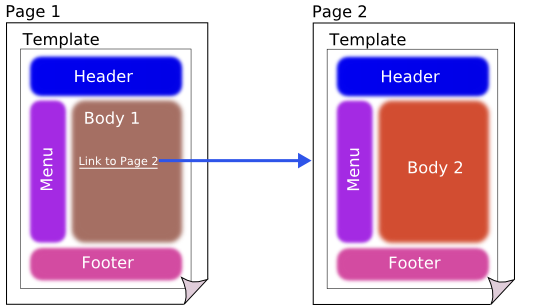 Tiles allows developers to define these page fragments which can be assembled into complete pages at run time. Let’s now add the content mentioned in above structure explaining each in detail. Apart from usual Spring dependencies, We have also added few dependencies for Apache Tiles 3. Additional dependencies can be added for more advanced tiles usage. 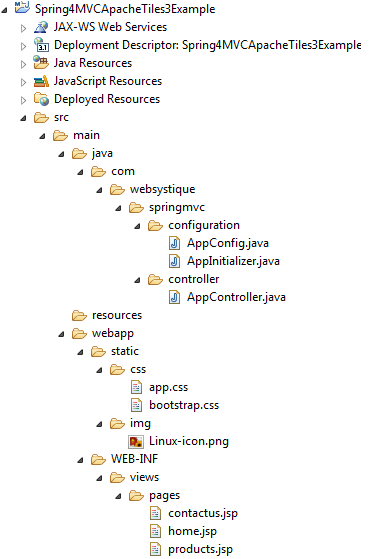 Maven Apache-tiles page lists all the dependencies from basic to advanced usages. Configure tiles in Spring Application configuration file. * Configure ViewResolvers to deliver preferred views. Highlights of above configurations are TilesConfigurer & TilesViewResolver. TilesConfigurer simply configures a TilesContainer using a set of files containing definitions, to be accessed by TilesView instances. Definition files are basically XML files containing layout definitions. In our Spring MVC application, we also need a ViewResolver. Spring comes with a Tiles specific ViewResolver named TilesViewResolver. Once configured, the view names returned from your controller methods will be treated as tiles view and Spring will look for a definition having the same name in definitions XML files. In above definition file, we have defined a base-definition and several other definitions extending base-definition. Other defintions are just overwriting the part they are specialized for. template attribute in definition-block is used to specify the actual layout file. Each of the definition (by name) can be treated as a tiles-view. In our case we have defined a basic layout [/WEB-INF/views/tiles/layouts/defaultLayout.jsp] pinned with definition using template attribte. This layout file provides the consistent look-n-feel across your application. If you want to change layout, define a corresponding layout file and attach to the definition using template attribute. As you can see, we have a header,footer,menu & body. We are using tags-tiles tag library to provide the placeholder within layout file. Attributes specified using insertAttribute will be provided by corresponding definition(or the one extending it). We have created some default views[used when the extending definition does not overwrite them] and some specific ones. Look at each of these controller methods. The returned value from them is treated as tiles-view [Thanks to TilesViewResolver] and corresponding tiles-definition gets consulted. Now build the war (either by eclipse as was mentioned in previous tutorials) or via maven command line( mvn clean install). Deploy the war to a Servlet 3.0 container . Since here i am using Tomcat, i will simply put this war file into tomcat webapps folder and click on startup.bat inside tomcat/bin directory. If you prefer to deploy from within Eclipse using tomcat: For those of us, who prefer to deploy and run from within eclipse, and might be facing difficulties setting Eclipse with tomcat, the detailed step-by-step solution can be found at : How to setup tomcat with Eclipse. Click on different menu items to see the content gets changes while preserving the actual look-n-feel. If you like tutorials on this site, why not take a step further and connect me on Facebook , Google Plus & Twitter as well? I would love to hear your thoughts on these articles, it will help improve further our learning process. Copyright © 2014-2017 WebSystique.com. All rights reserved.